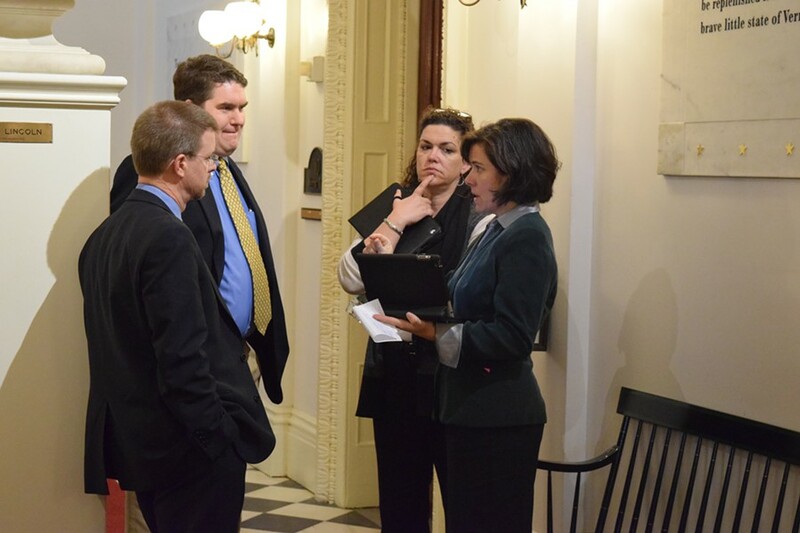 House Speaker Shap Smith (D-Morristown), left, talks Wednesday with Reps. Oliver Olsen (I-Londonderry), Laura Sibilia (I-Dover) and Mitzi Johnson (D-Grand Isle) about an education consolidation bill. On the eve of Wednesday's vote on a long-brewing school consolidation bill, discontent simmered in the ranks of the Vermont House. The bill would force many of Vermont's 277 school districts to consolidate into larger districts of at least 1,100 students by 2020. Plenty in the bill worried members as they considered how the legislation would be received back home. Some of those same worries had derailed a similar bill last year. A compromise version easily passed Wednesday by an 88-55 vote. Still, it generated criticism that lawmakers had backed off their promise to curb rising property taxes. The compromise involved one particularly nagging concern — a temporary spending cap designed to bring immediate savings. With no guarantees that consolidating schools would save money in the near future, the cap was supposed to offer that hope to frustrated taxpayers. Originally designed to limit schools to roughly 2 percent spending increases, the cap was like the flag at the center of the rope in the tug-of-war over consolidation. Some legislators supported the bill because it limited spending; others couldn’t live with the provision. Legislators on both sides huddled and decided to ease the cap. In the new version, it would not be imposed until 2018, would be triggered only if the total statewide school spending increases in 2017 exceed 2.95 percent and would last just two years. “It really sends a message to the school districts, ‘You need to hold the line on spending,’” said Rep. Oliver Olsen (I-Londonderry), who worked on the compromise. Rep. Emily Long (D-Newfane), a school board member who worried the cap would hit schools unevenly, said the compromise made her feel better. “There needs to be some form of downward pressure on property taxes,” she said. Others argued that easing the cap means the bill will fail to do the one thing lawmakers had promised: provide immediate tax relief. “Our property taxpayers need to see something in place to level off the continued steep climb. Unfortunately, the cap I hear proposed now as a compromise looks to me like a cap in name only,” said Rep. Tony Klein (D-East Montpelier), who ended up voting for the bill. House Education Committee chair David Sharpe (D-Bristol) said work will continue next year on funding. In the meantime, he is focused on this year’s consolidation effort. The compromise over the cap might have weakened the bill “a tiny bit,” he said, but the tenor of the debate has changed considerably from last year. The fact that Wednesday’s focus was on a spending cap rather than the angst over consolidating schools or worries about small-school grants indicates the shift, he said. “I’ve heard more and more people back home say, ‘We need larger school districts. We need to change the structure,’” Sharpe said. As Sharpe spoke after the vote, Rep. Chris Pearson (P-Burlington) approached. Pearson said he would introduce an amendment Thursday seeking to remove the spending cap. Sharpe nodded and invited Pearson to make his pitch. Pearson is unlikely to succeed in killing the cap on the House floor, but the Senate might do it for him.